Or Team Scotland rucksack, to be precise, with the request delivered while we descended in a hotel lift. Sure, why not? Or rather, why? It seems the ex-pat community in Gold Coast, even a couple of generations removed, still hold a candle for the old country, so the support for Scottish athletes in the Carrara Stadium should be significant. Not that the home support will be lacking for the host nation, however. Gold Coast is a beautiful sprawling city that lives up to the ‘surfers’ paradise’ name of one its districts. It is vaguely reminiscent of Florida, without the Americans. And it’s noticeably clean. The only graffiti spotted so far are two words ‘Go Aus’ inked across . . . the backs of cows in a field en route to the stadium. Seriously. Only in Australia. (And they do really say ‘G’Day and No Worries almost constantly – especially the Sheilas). Enough of the national stereo-typing. 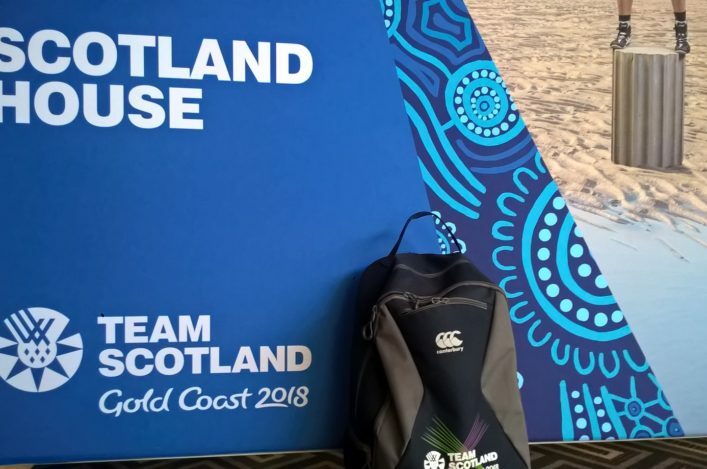 Scotland House is where athletes and team staff – as well as coaches and parents – are able to meet after events and relax. It is also the venue for media conferences for medal winners with BBC Scotland based in the hotel. 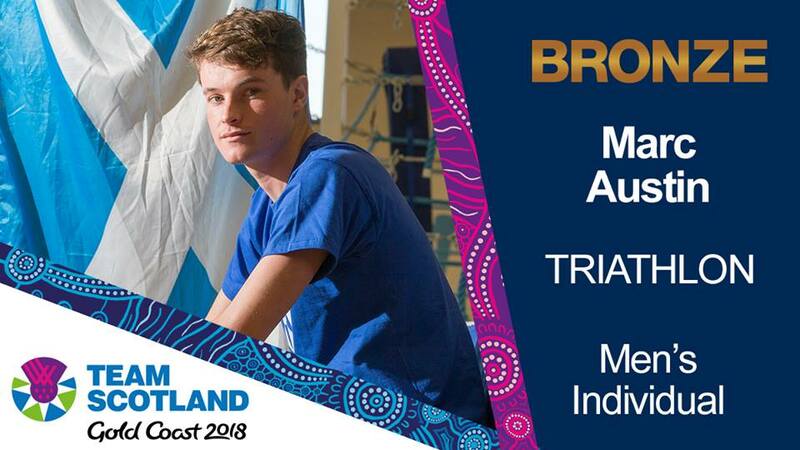 Marc Austin was therefore just about the first athlete ‘in the house’ the other day after claiming Team Scotland’s opening medal of the Games. Marc won a superb bronze in the triathlon on a day when the Brownlee Brothers didn’t make the podium. He’s well-known to those in athletes in Scotland of course having started out at Garscube Harriers and then moving to VP-Glasgow, where he was a contemporary of the likes of Sean Fontana, David Vernon and Martin Hayes. Marc also ran for Kelvin Runners at one stage. 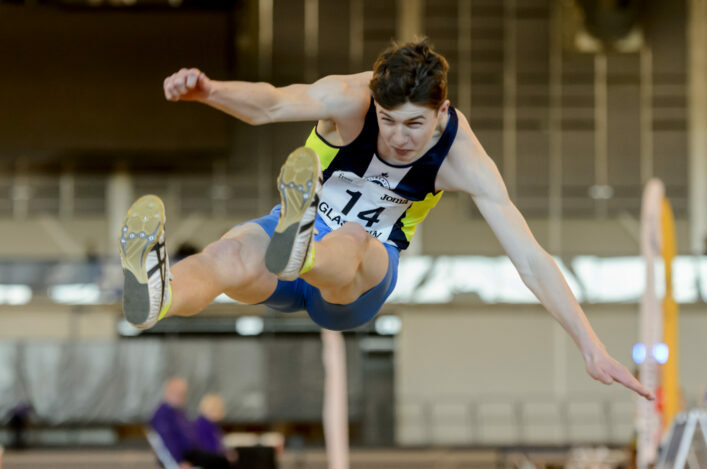 Through a Stirling Uni connection, Marc is also friends with Central AC athlete, Jamie Crowe, who is starting to post some significant times on the track in the United States. Adrian Stott, event organiser for the Scottish 5K Chams, was quick to point out Marc was a bronze medallist last year at Silverknowes. And he could return for Friday 4 May and the Run and Become event. ‘I need to just check dates and things but I am due to fly to Japan just after that for a triathlon the following week so it might be good to run the 5K Champs again before I leave,’ said the 24-year-old, who had a 15.12 split for the 5K run at Gold Coast. Kelsey Stewart’s tweet of two photos with Lynsey Sharp at, first, Glasgow 2014 and then the Opening Ceremony here caught our attention – and was a massive ‘hit’ on Facebook with hundreds of likes. 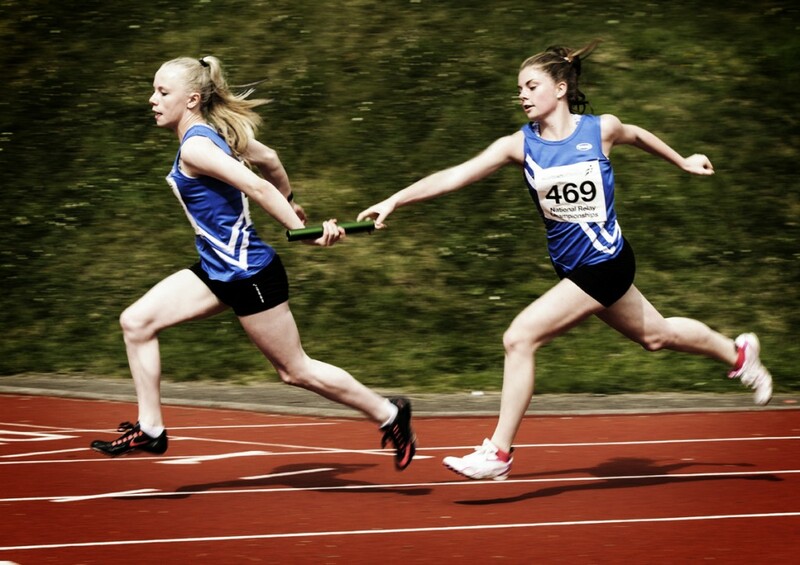 Kelsey is now 21 and there are three 18-year-olds in the Team Scotland athletics squad – heptathlete Holly McArthur and Para duo, Maria Lyle and Amy Carr. Holly, too, was in the stands at Glasgow 2014 and at that stage had only been in the sport for a couple of years. Beware the L-word. With a sense of utter inevitability, another ‘Legacy’ story emerged the other day – shortly before the action started in Australia. Once again, a survey said that there was no sign of increased participation in sport in Scotland linked to Glasgow 2014 and its aftermath. Big name athletes, across the likes of track and field, swimming and cycling, are not inspiring the next generation – according to BBC Scotland, who looked at this in a John Beattie programme not so long ago. It has to be said: this doesn’t really chime with the experience and the evidence of athletics in Scotland over the past few years. Some years ago, Steve Cram told us in PB he worried about the Glasgow 2014 ‘legacy’ because nobody has ownership of ‘legacy’ – no agency or body was actually responsible. That’s a fair point to an extent, but in fact it rests with clubs and volunteers (across all sports) and it that regard we really don’t think athletics in Scotland has been failed. *There has been a competitive legacy from Glasgow 2014, for sure. Scotland had five athletes in the GB team at the London 2012 Olympics and then had 15 selected for Rio in 2016 and 16 at the World Champs in London. *Scottishathletics ourselves had a membership of around 8500 in January 2012 and the figure now is almost bang-on 13,000. That’s a very strong upward curve in percentage terms. *And then you have a whole host of big rises in entry figures for events from National XC to Age Groups to Masters XC – many of these are at a 25-year high. 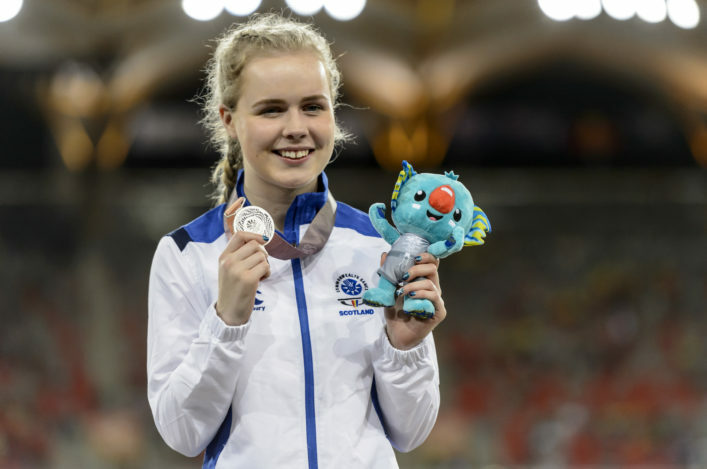 *A week on Friday the first National Champs after Gold Coast 2018 will see the 10,000m on the track Night of the 10Ks organised by Glasgow Athletics Association at Crownpoint. 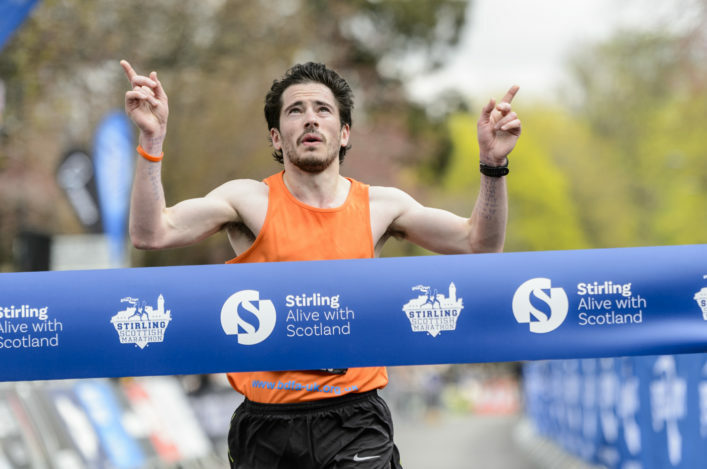 So far, there are 85 entries to create far and away the biggest 10,000m track event in Scotland for a number of decades – stretching right back to the time of Liz McColgan in the 1980s and Lachie Stewart in 1970. *Springburgn Harriers, a club almost dormant in 2014, opened up a youth section in July that year barely a fortnight before Hampden. The section now has over 100 members. These are separates sound-bites in a sense but, taken collectively plus much other anecdotal evidence, they suggest that development and growth is happening. The argument may really just be whether that fits the ‘legacy’ label.